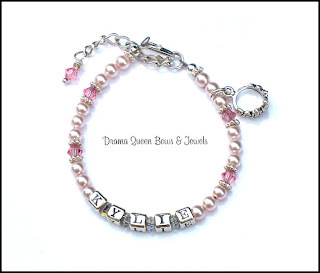 A fellow mom-blogger, Jess from My Silly Monkeys is doing a review this week of my Princess with name bracelet. Along with the review I'm giving away a $25.00 gift certificate that you can use at Drama Queen Bows & Jewels or Its All About The Jewels. So click on the banner to enter this and other great giveaways Jess has going on during her Spring Baby Event. I just posted a Spring Sale at Drama Queen Bows & Jewels. Everything on site is 25% off with the exception of bows sets and gift certificates.Discount codes not applicable during sale. This Friday isn't really a find it's an idea. Tonight I am hosting a Swap & Shop party. Basically I invited several friends to clean out all their closets and cupboards and brings their unwanted items to my house so they can unload it and possibly find new items. I broke it down to items from the following categories: Clothing & Accessories, Housewares,Health & Beauty and Books. I have approx. 8-10 woman coming and all seem pretty excited. Anything left over at the end of the night will be donated to charity. I'll let you know how it goes and have photos soon! Have a great weekend! Usually on Fridays I do a post on a fabulous find but honestly nothing has been ringing my bell lately. So instead I'm doing a Freebie instead. This freebie is coming courtesy of...me! At Drama Queen Bows & Jewels spend $10-$39.00 and you get 1 FREE HAIR JEWELS. Spend over $40.00 and get 2 FREE HAIR JEWELS. Any jewel from any category! These little beauties really are jewelry for your hair-each one is hand wired be me(never mass produced) with stunning sparkling Swarovski crystals. Trust me when I say that pictures do not capture their sparkle! I know what you are thinking "two post in one day? What has come over you?" Well I said a few weeks ago that I will give more attention to my poor forgotten blog and gosh darn it I mean it. Besides after scorching your eyes with my last post I felt I needed to give you something more pleasant to look at so here's my newest designs for Drama Queen Bows & Jewels. So that's my newest items. I'll have more to show you soon but I'm still editing the photos. Yup-that is exactly what it looks like! She is blinging out her vajajay! Bryce Gruber(click her name to see her review) from the Luxury spot was the brave soul who did this to review and apparently was very happy with how it turned out. It's called being Vajazzled and was done at the Completely Bare Spa in NYC. Don't get me wrong I loooove Swarovski crystals-I use them almost everyday. I have them on the bows and bracelets I make for babies and little girls-just can't imagine using them to decorate the place where they enter this world. Besides at the end of the day I like to leave my work in my studio not take it to bed with me but if this is your cup of tea more power to you. I think I'll be passing on this new beauty treatment! One last thing- if you decide that this is for you please don't offer to show me-I'll never be able to look you in the eyes again!